^ Castilla 2–1 Málaga. Real Madrid C.F. 2007-05-05 [2008-06-21]. （原始内容存档于2012-02-19） （西班牙语）. ^ Player file: Callejón. Liga de Fútbol Profesional. [2008-06-21]. （原始内容存档于2008-10-10） （西班牙语）. ^ Stats: José María Callejón Bueno. Real Madrid C.F. [2008-06-21]. （原始内容存档于2008-07-19） （西班牙语）. ^ Real Madrid and Espanyol reach an agreement for the transfer of Castilla's José Callejón. Real Madrid C.F. 2008-06-20 [2008-06-20]. （原始内容存档于2008-06-26） （英语）. ^ Callejon nets brace. ESPN Soccernet. 2011-01-15 [2011-03-01] （英语）. ^ Jose Callejon to play for Real Madrid. Real Madrid C.F. 2011-05-23. （原始内容存档于2011-05-26） （英语）. ^ LA Galaxy 1–4 Real Madrid. Major League Soccer. 2011-07-16. （原始内容存档于2011-07-20） （英语）. ^ Higuain gives Mourinho plenty to ponder. ESPN Soccernet. 2011-10-02 [2011-10-02] （英语）. ^ Perfect Madrid put six past Dinamo. UEFA.com. 2011-11-22 [2011-11-22] （英语）. ^ Ajax shattered as Madrid complete perfect set. UEFA.com. 2011-12-07 [2011-12-07] （英语）. ^ Real rout Sevilla. ESPN Soccernet. 2011-12-17 [2011-12-17] （英语）. ^ Un chupito revitalizante [Invigorating shot]. Marca. 2011-12-13 [2011-12-13] （西班牙语）. ^ El Madrid ficha hacia octavos [Madrid signs last-16]. Marca. 2011-12-20 [2011-12-20] （西班牙语）. ^ Real survive scare to go clear. ESPN Soccernet. 2012-01-14 [2012-01-14] （英语）. ^ Real Madrid spot on. ESPN Soccernet. 2012-01-22 [2012-01-22] （英语）. ^ Real Madrid attacker Callejon set to join Napoli. Goal.com. 2013-07-09 [2013-07-10] （英语）. ^ Callejon è a Napoli [Callejon is in Naples]. S.S.C Napoli. 2013-07-10 [2013-07-10] （意大利语）. ^ Napoli snap up Callejon. Goal.com. 2013-07-11 [2013-07-13] （英语）. ^ Napoli-Bologna 3–0: apre Callejon, poi la doppietta di super Hamsik [Napoli-Bologna 3–0: Callejon starts it, then double by super Hamsik]. La Gazzetta dello Sport. 2013-08-25 [2013-12-11] （意大利语）. ^ Napoli make their mark in Marseille. UEFA.com. 2013-10-22 [2014-10-27] （英语）. ^ Coppa Italia final: Rafael Benitez's Napoli beat Fiorentina 3–1. BBC Sport. 2014-05-03 [2014-05-13] （英语）. ^ Five-star finish for Napoli. Sky Sports. 2014-05-18 [2014-05-19] （英语）. 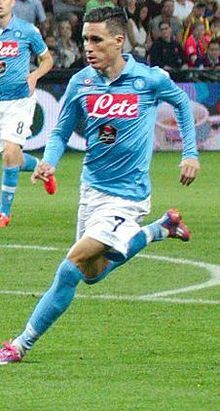 ^ Genoa 1–2 Napoli. ESPN FC. 2014-08-31 [2014-10-19] （英语）. ^ Napoli 3–3 Palermo. ESPN FC. 2014-09-24 [2014-10-19] （英语）. ^ Hernanes header helps Inter Milan to a 2–2 draw with Napoli. ESPN FC. 2014-10-19 [2014-10-19] （英语）. ^ Gonzalo Higuaín keeps rolling for Napoli in ‘match of fear’ against Roma. The Guardian. 2014-11-03 [2014-11-04] （英语）. ^ Serie A 2014–15: Team Of The Week – Round 10. Forza Italian Football. 2014-11-03 [2014-11-04] （英语）. ^ Sparkly Napoli flatten Club Brugge. UEFA.com. 2015-09-17 [2015-10-23] （英语）. ^ Sparkling Napoli finishes flatten Midtjylland. UEFA.com. 2015-10-22 [2015-10-23] （英语）. ^ Campanale, Susan. Serie A Week 31: Did You Know?. Football Italia. 2017-04-10 [2017-04-20] （英语）. ^ Spain 5–0 Kazakhstan. UEFA.com. 2008-03-25 [2008-06-20]. （原始内容存档于2008-05-20） （英语）. ^ Official: 23-man squad for the matches against Belarus and Germany. Royal Spanish Football Federation. 2014-11-07 [2014-11-07] （英语）. ^ Hunter, Graham. Much-changed Spain dominate Belarus. UEFA.com. 2014-11-15 [2014-11-15] （英语）. ^ Pasquale Salvione. Napoli, ecco Callejon: il pupillo di Mourinho [Napoli, this is Callejón: Mourinho's pupil]. Corriere dello Sport. 2013-07-01 [2015-04-20]. （原始内容存档于2016-10-07） （意大利语）. ^ Giovanni Battista Terenziani. Iturbe, Callejon, Gervinho: le tre migliori sorprese della Serie A [Iturbe, Callejón, Gervinho: the three best surprises in Serie A]. Calcio Mercato. 2013-10-14 [2015-04-20] （意大利语）. ^ José Callejón. Soccerway. [2014-03-09] （英语）. This page is based on the Wikipedia article 荷西·卡利祖; it is used under the Creative Commons Attribution-ShareAlike 3.0 Unported License (CC-BY-SA). You may redistribute it, verbatim or modified, providing that you comply with the terms of the CC-BY-SA.